Design work on a series of 24’x17′ theatrical backdrops for a satiric version of a “Jack and the Beanstalk” Panto set in East Van. This is the first backdrop and contains all the symbols of East Van, including Ken Lum’s famous East Van cross at Clarke and 2nd, as well as the harbour cranes, some crows on power lines, graffiti-bedazzled industrial buildings, and arguably the best view of the North Shore mountains in the lower mainland. 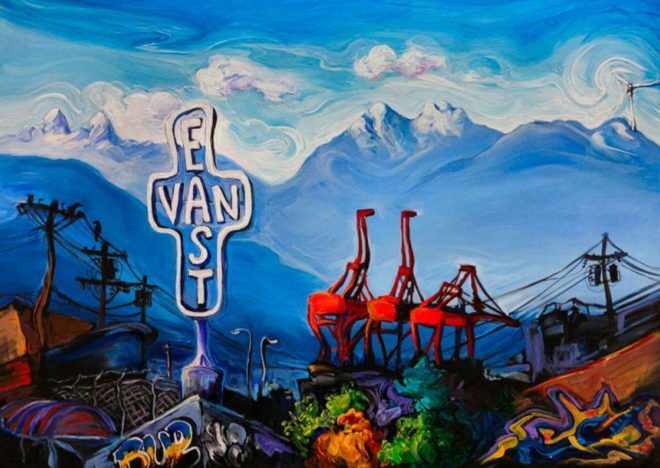 The panorama of East Van’s view spans the mountain silhouette from the EKG peaks of the Lions through the points of Crown and West Crown’s snow-veined mountains and to the pinwheeling wind turbine on top of Grouse. Every Vancouverite knows those peaks as well as the street they live on. I am making a simple east van website for my hobby, silver refining, located in the east side, can I use your picture has a backdrop. I can add your name in the Html as a credit. Sure. Let me know if you need a better photo. You can credit laurazee.com.